Beech Hill Terrace in Kendal sleeps 5 people. Beech Hill Terrace in Kendal offers fabulous, far-reaching views over the popular market town of Kendal and the parish church to the fells of Whinfell and Benson Knott; Beech Hill Terrace offers accommodation in a prime, elevated location. A traditional Victorian mid-terraced property, it offers guests the benefit of Kendal itself on the doorstep, with easy access to Windermere and the South Lakes, as well as the Western Dales, including the book town of Sedbergh. 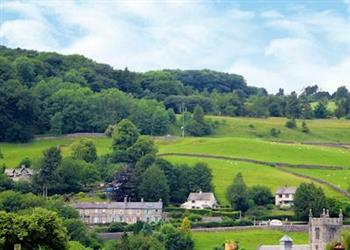 Popular local towns and villages including Kirkby Lonsdale and Staveley are all just a short drive away. Well proportioned, the property allows guests generous, well presented living space and the bonus of a delightful terraced garden area with seating to the rear which is a real sun trap (weather permitting!). Enjoy breakfast al-fresco or relax with a glass of wine after a hard day exploring the area! Spectacular views are enjoyed from all rooms at the front of the property – especially the bathroom, which offers the luxury of bathing with the most incredible view! Greatly enjoyed for its wealth of independent retailers, good selection of pubs, cafes and restaurants, Kendal is well known for its most famous export, Kendal Mint Cake. Chosen by the conquerors of Everest, walkers will no doubt enjoy its benefits whilst taking advantage of the fabulous walks in the area, whether facing the challenging peaks of The Lakes or strolling the yards and alleyways of the town. The shop, pub and restaurant are ¼ mile from Beech Hill Terrace in Kendal. Ground Floor: Beech Hill Terrace has 13 steps to entrance. Living room: With wood burner, Freeview TV, DVD player, iPod dock and CD player. Kitchen/dining room: With double electric oven, induction hob, microwave, fridge, freezer, dishwasher, washing machine and French doors leading to garden. Gas central heating, electricity, bed linen, towels and Wi-Fi included. Initial logs for wood burner included. Travel cot and highchair available on request. Welcome pack. Enclosed garden with sitting-out area and garden furniture. Parking permits for 2 cars included. No smoking. Please note: The garden is Terraced with 26 steps over two flights. There is shared access to 2 neighbouring properties at the front. Holidays at Beech Hill Terrace run from Friday to Friday. For a better idea of where Beech Hill Terrace is, you can see Beech Hill Terrace on the map below. Beech Hill Terrace is in Cumbria; should you be on the lookout for a special offer, you can find all the special offers in Cumbria. It's always worth checking to see what is on offer at the moment. Do you want to holiday near Beech Hill Terrace (UK1032), you can see other cottages within 25 miles of Beech Hill Terrace; have a look to find your perfect holiday location.